Vintage original 6-1/2" x 8-3/4" photograph mounted to card, matted and framed to 16-3/4" x 18-1/2". This is the image taken by (Timothy) T. O'Sullivan in June, 1863, photograph was printed by Alexander Gardner in his book (see below). O'Sullivan, Entered according to act of Congress, in the year 1865, by A. Gardner, in the Clerk's Office of the District Court of the District of Columbia, Positive by A. Group of Confederate Prisoners At Fairfax Court-house. Published by Philip & Solomons, Washington. Appears to be very clean with a few small spots. Alexander Gardner (died 1882) was a Scottish photographer best known for his photographs of the American Civil War, U. President Abraham Lincoln, and the execution of the conspirators to Lincoln's assassination. In 1866, Gardner published a two-volume work, Gardner's Photographic Sketch Book of the Civil War. Each volume contained 50 hand-mounted original prints, of which this is one. We guarantee the authenticity of all items we sell for life. PLEASE SEE OUR OTHER LISTINGS! OUR BUSINESS CONTINUES TO GROW THROUGH THE RECOMMENDATIONS OF OUR CUSTOMERS. YOUR REFERRALS ARE GREATLY APPRECIATED! 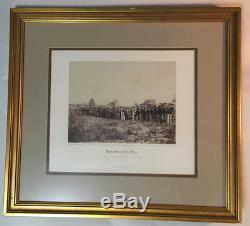 The item "ALEXANDER GARDNER original 1865 CIVIL WAR PHOTOGRAPH Confederate POWs at Fairfax" is in sale since Tuesday, April 17, 2018. This item is in the category "Collectibles\Militaria\Civil War (1861-65)\Original Period Items\Photographs". The seller is "thingzlimited" and is located in Bayside, New York. This item can be shipped worldwide.